As school librarians we are constantly giving book recommendations; in fact once I’ve read an incredible book I can hardly wait to tell everyone I know about it and put it in their hands too! However, there have been times when someone will walk into the school library and say “I don’t know what to read, what do you recommend?” and my mind will go blank. 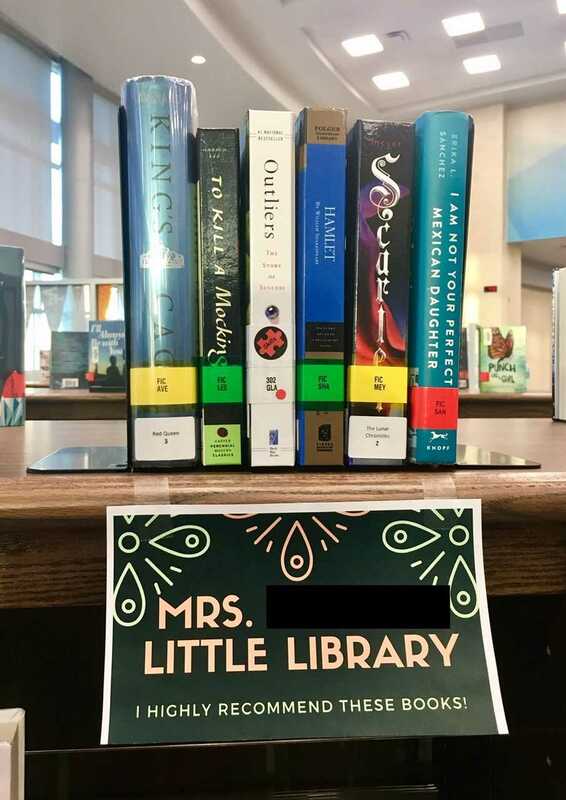 Working in the school library requires multitasking, shifting from one need to another in an instant, and sometimes the titles I love and highly recommend to all readers will just not come. Therefore, this year I have an addition to the circulation desk, my little library. My little library consists of seven or eight book titles I would cheer about, tweet about, and gift to others; they are books I feel passionate about and want others to love as much as I do. I try to pull from a variety of genres and include books that will appeal to girls and boys. Every now and then this will prove a challenging task, since I, like many others, have my niche of books I like to read and books I do not. Horror is not my thing and gives me nightmares. However, one of my goals each year is to expand my reading list to include other genres or books I would not usually pick up. My little library will help encourage me to work on that goal of expanding my reading horizons so I can display an even wider range of books for my patrons. A couple times a month or when the collection starts to dwindle, I will replenish my little library with other books I love or new books I have recently finished reading. 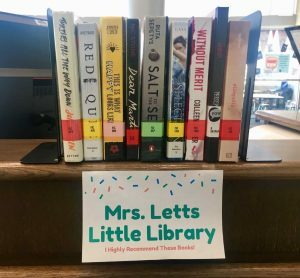 We have also begun encouraging teachers, administrators, and staff members to give us a list of books they highly recommend, and we display their selections throughout the library. It is important to model to our students that we never stop reading, that reading is not just a school requirement, and we all read. 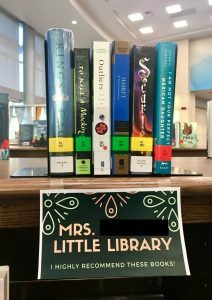 The little libraries help promote a school-wide reading culture in which all members of the school community are engaged in reading. Involving teachers in promoting reading also helps kids to find a book they may love; if a student likes and respects a teacher or staff member, they may be more inclined to peruse that teacher’s little library and give one of their books a try. The little libraries also serve as an example of readers enjoying many different genres, which is something we encourage students to do–step outside of their comfort zone and try a new genre! 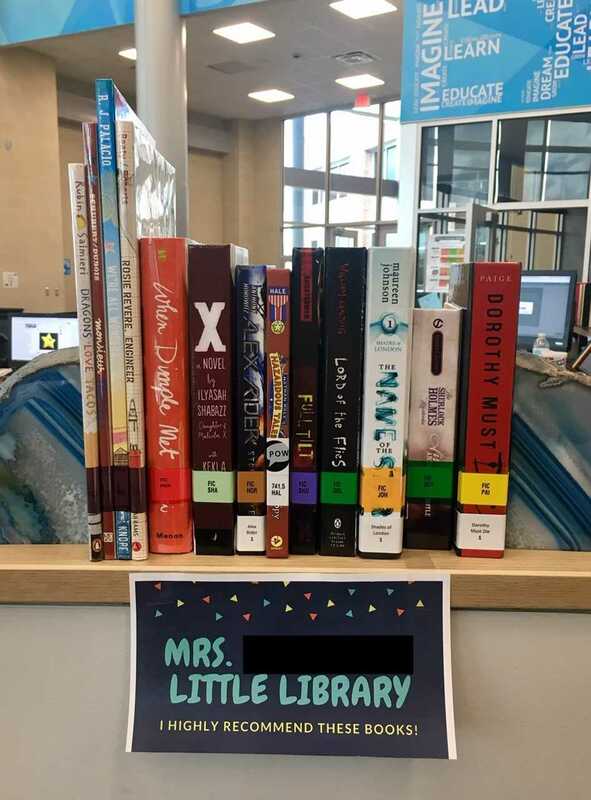 As an extension, I would also love to have teachers come into the library and read an excerpt from one of their beloved books to students; having students hear the stories that teachers are passionate about would further promote a school-wide reading culture and possibly inspire those students to read the shared book. I believe anything we can do to inspire our students to read and to help them find a book they love is worth a try! What a wonderful and simple idea…. I sent this our to all District libraries and have had positive responses. Thank you! I LOVE this idea! I think it is a great way to not only recommend books, but to get the teachers more involved in the library. Thanks for sharing! Thank you for this fabulous idea! I am going to try this right away.